Movement. It is the process in which we transition from one place to another. It symbolizes change. Every single person on this planet is engaged in some form of movement. Some people move their lives in a direction towards fear, greed, or suffering. That movement then becomes visible in the form of wars, corporate scandals, and outright unhappiness. Our lives are temporary here. We are like wind, arising only to pass away. The only question that matters is in which direction are we moving? Are we moving towards love? Love is not something that is taught to us. We don’t learn it in our schools, at our jobs, at the shopping malls, or in our TV shows. Love, which is indisputably the most important thing in life, is the one thing that we forget to cultivate in our daily routines. We cannot say that we know what Love is; we too have come here to learn. We hope that we have not come here to take anything, but rather to offer the world a piece of our own hearts…thereby teaching ourselves how to love. As a fully volunteer-run network, we have no paid staff and no office space. We are comprised of individuals who believe that what we do, what we say, and what we think starts a profound cause and effect chain reaction in the world we live in. Volunteers in numerous cities work together to coordinate various projects and to genuinely move to a place of greater good. Be the Cause, at best, is a reminder of the things that matter most in life; as a metaphor for the movement that we are all engaged in. By laying one foot on the ground the other follows. Only by beginning can we move forward. 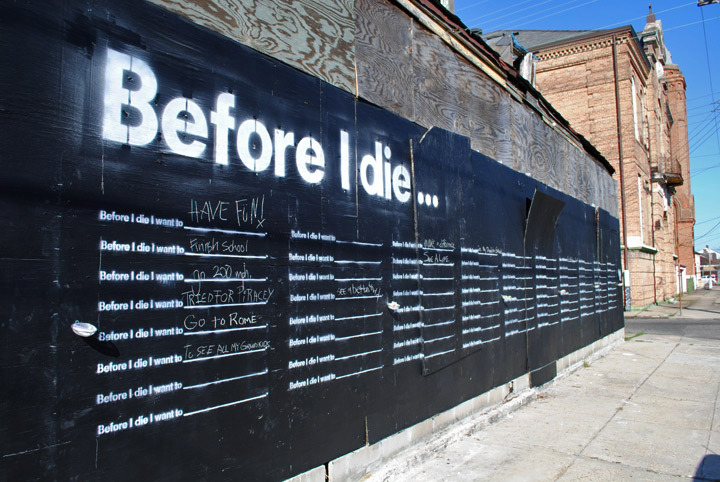 We came across Candy Chang’s ‘Before I die” project and wanted to ask you: What one thing would you like to do before your time here runs out.